Why Don’t We Empathize First? Last week, I advised empathizing before advising. To attempt to remedy my hypocrisy, I will now empathize with the desire not to empathize. Because there really are a bunch of good and legitimate reasons we try other tacks. I’ll say some reasons I don’t empathize, so I’m not speculating too much about general motivations, but I think my reasons are common ones. A big reason I don’t empathize is that when I perceive what seems like an obvious gap in someone’s thinking, or thing they could do to fix their situation, I get excited! I really do want other people to be happy and like helping them, and often I feel impatient about getting right to the heart of things. Plus, people are often asking for non-empathy things, such as advice. A related thing is that a big part of me likes conversations to be fast-paced. This goes along with being impatient, but it’s not the same thing. I like the energy and positive affect that comes from getting ideas out there quickly. I like conversations where everyone is interrupting everyone. Not everyone does, and I try to reign in this tendency of mine depending on context. The feedback I got indicated that the “ask a personal question” rule was the most helpful. 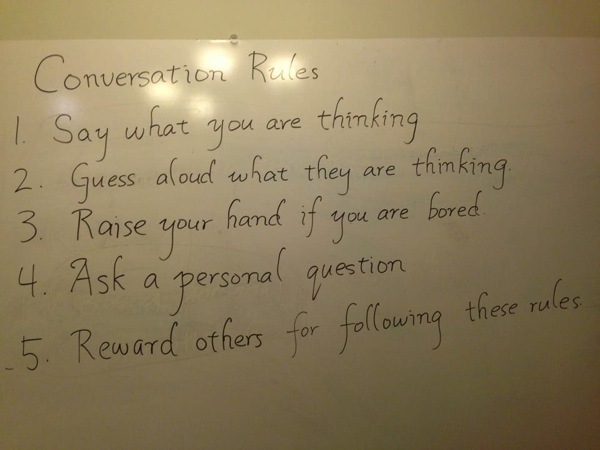 I suspect that setting the intention to have good conversations in the first place was more effective than the specific ruleset, but it’s hard to know with these things. I consider the ruleset an alpha version, and I want to experiment much more with parties specifically designed to produce good conversations.